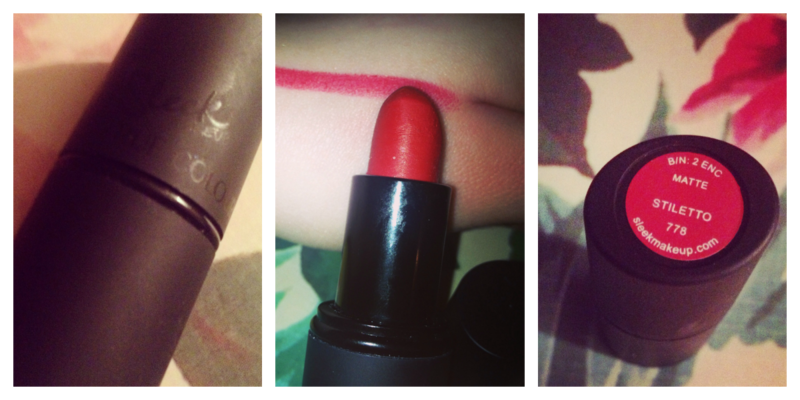 If you are anything like me you will have a soft spot for a red lip stick. 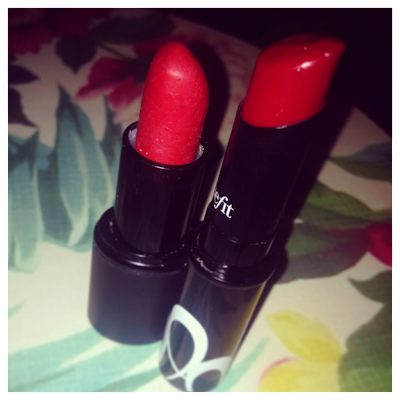 There is no better excuse than winter to dig out and fashion your favourite red lipsticks. I received Sleek's True Colour in 'Stiletto' in December's Glossy Box and I was over the moon, if any of you viewed my you tube video of the unveiling of this you will see how excited I was. This is what I would describe as an everyday red. It is quite a bright red though the photos make it look a bit rosier than it actually is. I have received a few compliments when I have worn this out. It is a matte lipstick so doesn't feel creamy to apply unfortunately, quite solid - if that makes sense. Though, the staying power is brilliant even after some drinks. If you want to make your lipstick last a bit longer i'd recommend putting benefits 'plump me up' on as a base before hand. This will make your lip colour last slightly longer than without it. Next we have benefit lipstick in 'Frenched' and out of the two if I had to choose i'd say this is my favourite. This is a very deep red, i'd describe it as a berry shade. On application this lip stick just glides on it is so smooth and creamy I really like it. I always feel great when wearing this, it is very WOW! Do you have a signature red? How does it make you feel? is starting to become too heavy to carry -- as opposed to just end payment, which could severely hurt their credit score. Prior to looking for pre-qualified loans, it's vital that you understand several financial aspects pay day uk when and if you decide to try to get the loan modification, there should be described as a hardship letter which you have to type in by it.